Having moved to our wonderful new home in March of this year, I haven’t been trying out many new recipes lately but sticking to my tried and trusted favourites. We are having such an exciting time sorting everything out and my collection of “must try” recipes is getting bigger and bigger by the week. We are very lucky to have four raised beds down one side of our garden (south facing as well) and I was determined to get my herbs under way as soon as the undergrowth was removed. 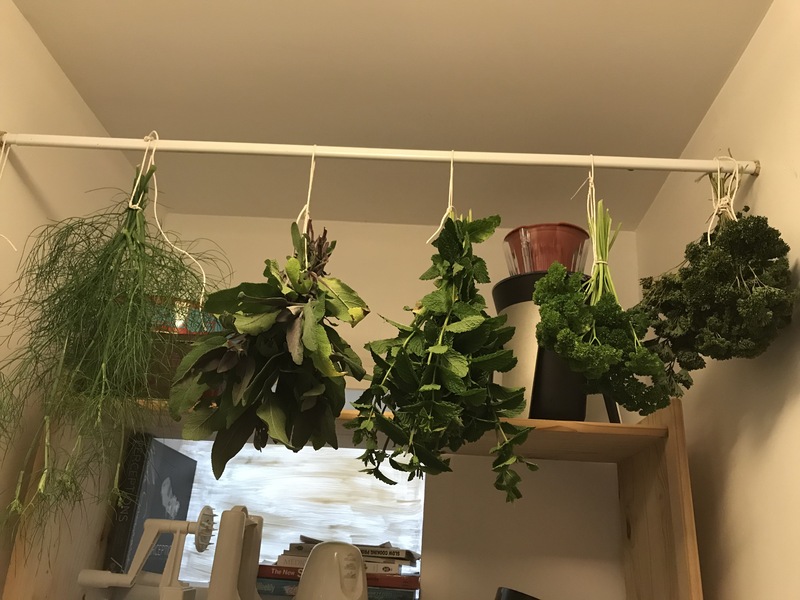 I don’t think there is anything nicer than using fresh herbs from your own garden and when they grow in abundance, then is the time to dry them. I love having a walk-in larder now and it is the perfect place to dry herbs. An old extending curtain rail was a perfect fit for one end of the room. 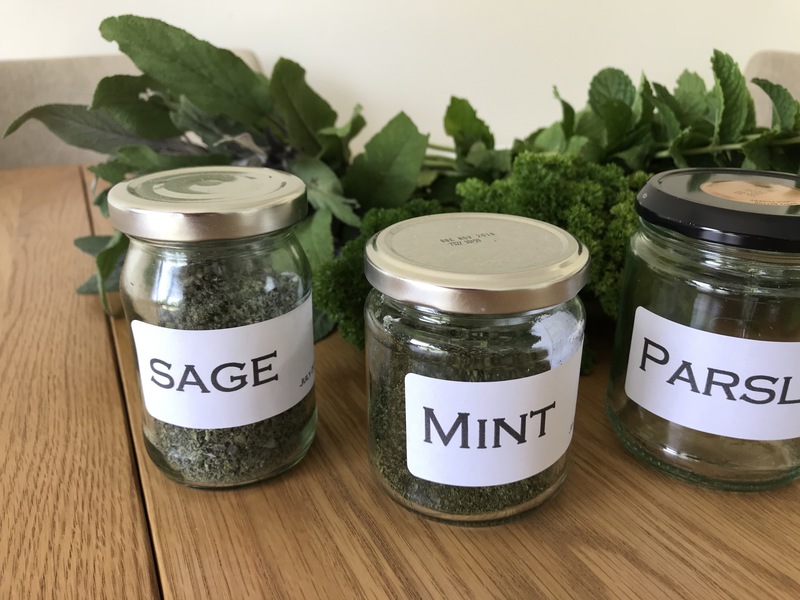 So far, I have dried mint, sage and parsley and they easily crumble into the large cup of a Nutribullet and a very quick burst breaks them down. I’ve been saving my glass jars for just this purpose. It’s been a wonderful summer for herbs and I have masses of coriander, fennel, basil, thyme and rosemary growing away as well as the mint, sage and parsley. My coriander has done so well that I am leaving some flowering so that I can collect the seeds. Perhaps it is the dry summer, or maybe it is where I am living now, but my basil is doing exceptionally well and I haven’t yet seen a slug. Back on the mainland I had to grow basil in hanging baskets and even then the snails and slugs managed to reach it. This entry was posted in Favourite Ingredients, Miscellany and tagged Coriander, Dried Herbs, Fennel, Herbs, Mint, Parsley, Rosemary, Sage, Thyme. Bookmark the permalink. Makes the larder smell nice too!